Volunteers will have the amazing opportunity to visit the untamed beauty of the Wilderness Reserve near Tzaneen in the Limpopo province of South Africa. The Reserve is about 70 kilometres from Phalaborwa, Tzaneen and Hoedspruit and only about half an hour's drive from the famous Kruger National Park. 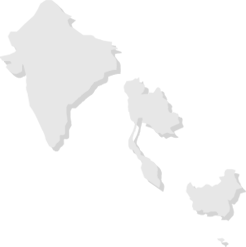 The area is known as the Lowveld and is rich in wildlife habitat. You will be based on a diverse, large and beautiful Reserve where animals roam freely. All the roads are dirt roads making it easy to check tracks and animal movements. There are wonderful views of the magnificent Drakensberg Mountains. The Selati River flows through the reserve and there are wonderful indigenous trees, making this a favourite haunt of lions and elephants. The reserve runs breeding programmes of rare and endangered species including sable, reedbuck and nyala antelope. Brown Hyaena, rescued from farmers’ traps have been introduced. Cheetah, eland, African wild cats, and tsessebe are among the different species also brought in. The reserve also conducts research contributing to a huge variety of projects and monitoring both on the Game Reserve and beyond, such as the Cheetah Metapopulation project, which aims to develop a national metapopulation management plan for cheetahs in smaller, fenced reserves and is one of the key aspects is to ensure adequate gene flow among fragmented sub populations. This project brings new challenges and developments each day and volunteers get involved hands-on in the monitoring and research of the wildlife and the natural environment at the reserve. Volunteers will also have the unforgettable experience of sleeping out in the wild underneath the stars, making it a truly wilderness experience. 2018 Shutdown Dates: 11 Dec 2018 - 6 Jan 2019. The Wilderness Reserve covers 24,700 hectares of beautiful, unspoiled land. The work undertaken is varied and covers two main areas: reserve management and wildlife monitoring. Volunteers will spend time observing in the field and collating many different kinds of data, will learn the skills needed for data capture techniques and will receive training to use the research equipment such as GPS consoles and when needed, radio telemetry equipment. The data collected contributes to a huge variety of projects and monitoring both on the Game Reserve and beyond. This work is essential to facilitate appropriate management decisions on the reserve. Furthermore, much of the data volunteers assimilate will contribute towards projects and research being carried out by fellow conservation organisations. For stays of 4 weeks or longer, a volunteer’s first week will be an orientation period during which to learn the principles and goals of the reserve and gain a general knowledge of conservation and its importance in South Africa. Volunteers are then immersed into a huge variety of reserve and conservation activities. There are various ongoing research and conservation projects at the reserve, many of which offer opportunities for volunteers to become involved in research that has the potential for use in other parts of Africa. Examples of such projects are detailed below. Please note that projects are subject to change as some complete and new ones begin. 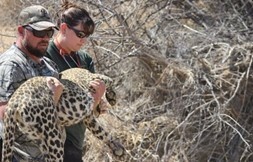 Since 2009 the reserve has run a cheetah reintroduction programme. All new cheetahs are fitted with a radio collar and their initial survival and progress is closely monitored. The data collected is then used to assist continued cheetah conservation efforts in both the Lowveld and South Africa by contributing to the EWT (Endangered Wildlife Trust) Cheetah Metapopulation Project. The project aims to develop a national metapopulation management plan for cheetahs in smaller, fenced reserves and one of the key aspects is to ensure adequate gene flow among fragmented sub populations. Life history, survival and breeding data are collated for each reintroduced cheetah and wherever possible, DNA samples are taken to add to the nationwide genetic database. The project sends data for all reintroduced cheetah and has also contributed two samples to the genetic database. The reserve is currently on the waiting list to accept a new female cheetah which will be monitored by the team and contribute further to the project. Information from the reserves cheetah reintroductions is also contributing towards research on the conservation biology of cheetah in fenced reserves. The research is being carried out in association with the EWT (Endangered Wildlife Trust) and University of Tshwane, South Africa and incorporates many different aspects of cheetah survival and ecology. Data provided for the research includes cheetah spatial movements, feeding habits, habitat use and relationships with other predators. Poaching is now taking a tremendous toll on South Africa’s rhino population as demand for the horn continues to soar across the Far East. A key goal is to protect the reserve’s rhinos from falling victim to this barbaric trade and in turn contribute to the conservation of the species as a whole. In 2012, the decision was taken to dehorn the rhinos on the reserve, therefore removing the reason that the poachers have for killing them. To safeguard the rhinos, the team works continuously to cover all aspects of the anti-poaching plan. 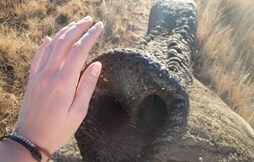 Volunteers assist with rhino monitoring on a regular basis. Learning the rhino’s home ranges and behaviour patterns is important to enable monitoring and patrolling more effectively. Sleep outs around the reserve also provide an extra opportunity to monitor any unusual activity. Data collected by volunteers contributes to the Vulture monitoring project, part of the EWT (Endangered Wildlife Trust) Birds of Prey Programme. The project aims to ensure the survival of all vulture species throughout the southern African sub-continent. Data on vulture nesting sites and other raptors are collected by volunteers and passed on. Sightings of tagged vultures are also reported to the project by the team. The Southern Ground-Hornbill is a flagship species for the savannah biome classified as Endangered (IUCN) within South Africa. With their numbers still in decline, an estimated 1500 remaining birds require immediate assistance to prevent the species becoming extinct outside protected areas within the next 3 generations. The Mabula Ground-Hornbill Project is working to slow decline through a variety of techniques including the harvesting of chicks, re-wilding and reintroduction and the provision of artificial nesting sites. This team works in conjunction with the project to build and place artificial nestingboxes and also provide spatial data for the Ground Hornbills on the reserve. Volunteers have freetime on Saturday afternoons and Sundays and there are plenty of activities on offer. 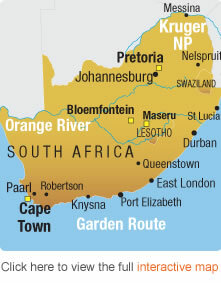 Popular places to visit are the Kruger National Park and Blyde River Canyon. Volunteers are asked to arrive into Hoedspruit Airport for the inclusive pick up and drop off and full details will be provided in your pre-departure pack. Hoedspruit (Eastgate Airport) is a short connecting flight from Johannesburg. There may be a number of ways to reach your destination airport - for information and advice please contact Amanzi Travel who hold an ATOL licence and who can help to arrange your flights for you. Before heading straight back home, why not take an Overland Journey through Africa to explore more of the wonderful sights and experiences that this beautiful continent has to offer. You can take a trip that starts and finishes in the same city (eg Windhoek to Windhoek) or you can use it as an opportunity to get your from one city to another (eg Cape Town to Nairobi). Southern Sun 21 days, Cape Town to Victoria Falls - Jennie and Stuart, Sweden, aged 32 and 34. 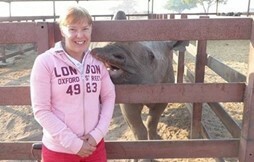 Tanzanian Game Parks and Zanzibar, 10 Days and Masai Mara Safari, 3 Days - Sara, Canada/Malaysia, aged 20. From 3 days to 56 days, take a look at the exciting Overland Trips here. 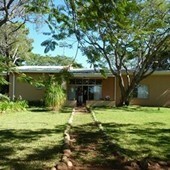 Volunteers live in a lovely shared house located in the Reserve and all kinds of wildlife visit the surrounding bush. An electric fence surrounds the house and garden so volunteers can move freely around. Up to four volunteers share a room and en-suite bathroom and there is plenty of storage and mosquito nets are provided over each bed. All linen except towels is provided and the local house mother does washing - and even ironing! - for volunteers twice a week as well as keeping the house, rooms and bathrooms clean. There is electricity so hot showers and air conditioning is available as well as power for charging camera batteries etc. 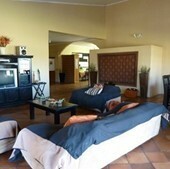 There is a large open plan lounge with big comfy sofas and dining space for evening meals. Breakfast is normally taken in the large kitchen/breakfast room and there is a library/study area where volunteers can work at big tables. 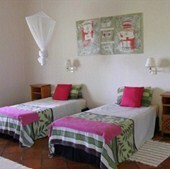 There is also one double room for couples - please request this when booking. Outside is a braai (barbecue) where many happy evenings are spent chatting and getting to know fellow volunteers, and a small splash pool that allows volunteers to cool off at the end of a day in the hot African sun. There is plenty of space for frisbee, cricket, football and rugby and sporting equipment for volunteers' use. There are safe places for walking or running for anyone who likes to exercise in this way. There are plenty of places outside to just sit and write a diary, take a siesta or watch the animals passing by. Herds of impala, giraffe, rhino, elephant and lion regularly visit and the rare antelope breeding camps border the garden so there is always something to watch! There is also a small, attractive waterhole that was built by previous volunteers which attracts lots of birds, insects and amphibian life. There is even a vegetable garden and volunteers assist with its upkeep so that fresh organic vegetables are available for meals. The house also has internet connection for volunteers to use. Three meals a day are provided, with many being cooked for you, however volunteers will also need to help with meal preparation as part of their daily duties. Any special dietary requirements must be advised in advance. Soft drinks and snacks can be purchased during the weekly town trip. There is a small tuckshop at the volunteer house which sells soft drinks, chocolate, beer etc. My experience at Askari was out of this world. 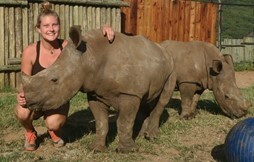 I learnt so much from Katie and Ed because they are incredibly passionate about animal conservation. This place is magical. I got so close up the animals and saw such a rich array of flora and fauna. I loved this place! I would highly recommend it to anyone. Had a fantastic time in Africa. Thank you for all your hard work in organising my adventure. It has certainly been a trip of a lifetime and a life changing experience. Will look through my many photos and send some in the near future. 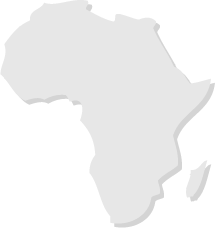 A trip to volunteer in Africa should be on everones to do list. It is an extremely rewarding and fullfilling experience. Amanzi Travel took the time to ensure that I was placed in the right projects to suit my needs and requirements. You need to approach volunteering with an open mind but the more you put into a project the more you get out off it. i was well looked after on all my projects from the pick up at the airports right through to the end. Everyone was extremely friendly. The only down side was having to leave Africa. i certainly did not want to come home. 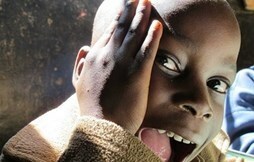 Volunteering in Africa has certainly been a life changing experince and one I would recommend to anyone. I have made it home after an amazing 3 months. All the pre-departure information was accurate and when I arrived I was welcomed to Africa by Katie before being thrown straight into the reserve work as they were darting and moving animals- what an amazing welcome to Africa. Katie and Joe are wonderful hosts, great guides and teachers and quickly became friends. Nothing is too much trouble and they are always willing to share their vast knowledge, expertise and experience with you. The work was varied and interesting, from road clearing and removal of alien plants to herbivore counts and brown hyaena research. Every day was different and never boring. The accommodation and food were great. All in all a fantastic project that I would recommend to anyone. Looking forward to my next adventure now. They have a tough act to follow! Thank you for all the amazing experiences that we have had. African wildlife really has grabbed us and we will most definitely do a volunteer project again. We were very pleased with the way Gemma kept us informed and especially about the fact that a tailor-made programm was made for us. This project truly offered a rustic African experience that went far beyond just observing animals. We really "lived the bush-life" realized by the fact that we were intensively trained in tracking, identifying all the animals and trees and animal behaviour. In Tuli you really experience the Wildlife-life in Africa. The camp is unfenced, so every morning you can walk around the camp searching for tracks of the animals that visited the camp during the night. This was not frightening at all, but very exciting! We saw a lot of animals during our stay and the staff taught us a lot about tracks, tracking and animal behavior. The staff was also very knowledgeable about all the animals, so they knew when to proceed and when to back-off. 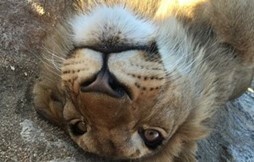 Due to the staff we never had a dull moment, but everything was done in the animals interest; so if an animal showed it did not like our presence, we backed off. We loved our stay in Tuli. We saw beautiful animals every day, logged a lot of information and learned a lot! I can recommend this project to anyone who loves animals and wants to live the African bush-life for real. During this project we directly helped the wildlife in the area by the activities we did in Reserve Management (erosion control and removing alien vegetation). It is only a small area that you can cover during a morning or an afternoon, so you will have to keep looking at the big picture; all the volunteers together make a difference, not you alone. We had a wonderfull stay in the reserve.... During this project you live in an volunteer house in a fenced area. The volunteer house is very comfortable and luxurious...and everything for a pleasant stay is available. Town trips are made once a week so you can buy some drinks etc. Every day there is a schedule with the general tasks the volunteers have to perform, like feeding Kevin the Warthog, logging the weather conditions, cooking lunch or diner or washing the dishes. We very much appreciated the fact that we were trained in practical four-wheel-driving and shooting a rifle amongst the other very interesting activities. The reserve itself is very large and a lot of animals are present. We had some great sightings of all kind of animals. The day consisted usually of two activities; one in the morning and one in the afternoon. The activities we performed were; game counts, removal of alien vegetation, erosion control, drives through the area, feeding of animals which were kept in separate areas for different kind of reasons, brown hyena research and sleep outs. Each time we saw something special, like a lion or an elephant, we took our time to admire and photograph the animal. The staff was very experienced in "reading" the animals, so when an animal was agitated, we backed off and left it alone, but when it was relaxed, they took us really close! The staff was very supporting and helped us to plan a weekend trip to Kruger Park, since you have free time on Saturday afternoon and Sunday.